Fireworks, sparklers, hot summer sun, cookouts, and baked beans. When I was growing up, summertime was my favorite time, and to me, the Fourth of July was the best holiday of the summer season. I lived in a tiny town of 2400 people in rural, central Pennsylvania where I left the house in the morning and didn’t return until dark. My friend’s and I would roam the woods, play under the old wooden bridge, and walk the couple of miles to town, crossing a towering rusty railroad trellis that loomed a good 50 feet above the Susquehanna River below. The Fourth of July was a magic day for me. One of our neighbors, a bald, tattooed, big guy whose name I kept thinking was Kip, but then remembered was actually Pick, would buy contraband fireworks across the state line. He’d bring his haul back to our little neighborhood on Irwin Hill and set off a huge display. Now that I’ve really seen a grand firework display, I realize Pick’s show was really a dud, but to my seven year old self it was a magnificent extravaganza that illuminated the twinkling July sky. After our indoor picnic dinner, I’d anxiously await the sunset, the darkening sky, and my friends return from their family gatherings. As soon as dusk arrived, my friend’s and I would busy ourselves with sparklers and those little black dot-sized discs we’d light on fire and watch curl into tiny snakes. Pick wouldn’t set off his big firework display until the sky was dark as pitch. Once he set off the first crackling star, we’d all sit in the yard to watch. Even my dad would come out and ooooo and awwww with us. Our July Fourth celebration this year will be at the Dusty Dog with all of our canyon neighbors and some friends from town. We won’t have any fireworks out here because the cabin is in Carson National Forest and they’re prohibited. Plus, it’s really dry and one little stray spark could set a wildfire ablaze. Whatever you have planned for your Fourth of July celebration, I hope it involves a grand firework display, some of those tiny snaking discs, and a lot of good picnic food that you eat in the great outdoors. 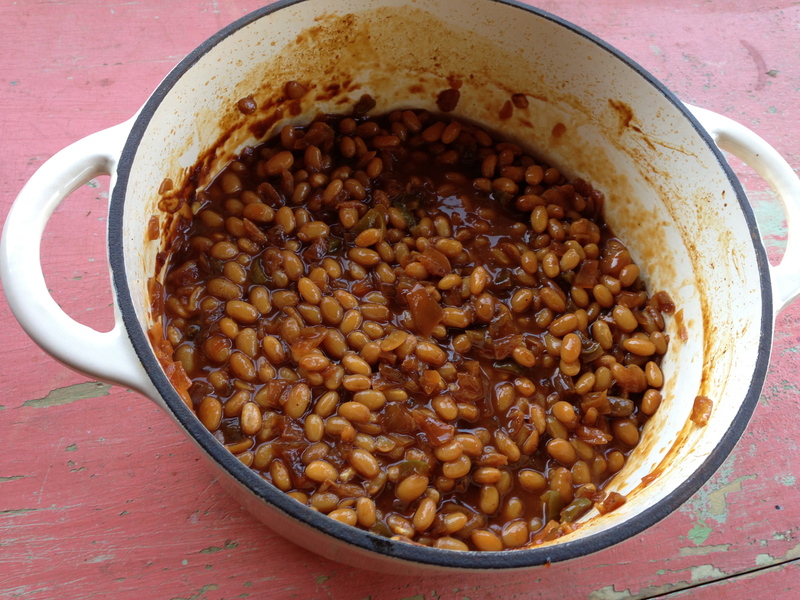 If you don’t know what to serve as a side, consider this confection of baked beans. Happy Independence Day and enjoy your picnicing! Please Note: I realize that you don’t have time for any bean soaking at this point in your July Fourth day, but never fear, my mother never soaked a bean in her life. 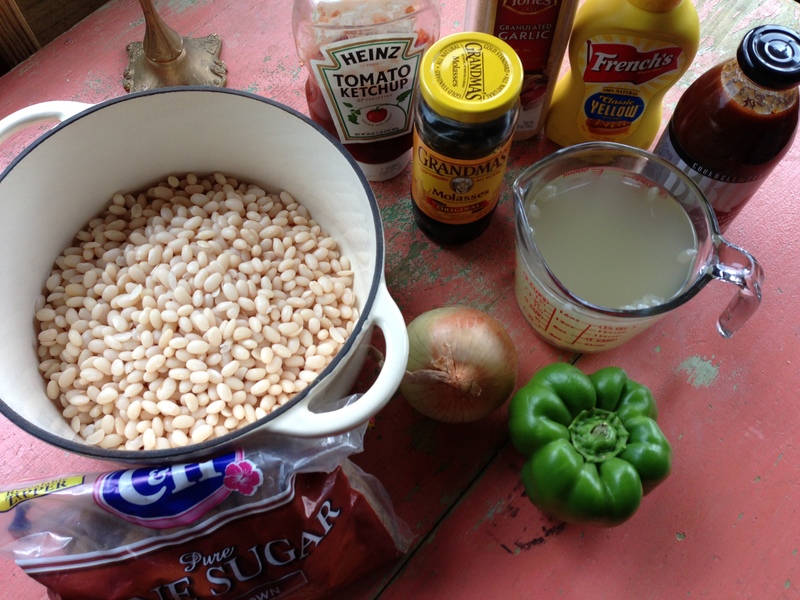 She’d open up several cans of baked beans, rinse them off, and there she’d have her pound of northern beans. It’s not really cheating. Soak beans overnight in enough water to completely cover the beans. Remember beans grow about double their size, so use more than enough water to allow for your beans to expand. Rinse the beans in the morning. At high elevations, there is no way a bean will ever get soft unless you use a pressure cooker – I’m speaking from experience here. I know, I know, you’re afraid of the pressure cooker. I used to be just like you – afraid of all that steam and well, pressure. It does seem like the lid will explode off, but that is what it’s supposed to seem like. Don’t worry, get out your pressure cooker, place your soaked and rinsed beans in there with enough water to cover the beans. Don’t use too much water or you will have a dripping, release of water and steam – again, I’m speaking from experience. Pressure cook the beans for 40 minutes. If your pressure cooker has different settings consult your pressure cooker book to determine which setting is best for beans. Mine has two settings and I use the number 2 setting for beans. After you’ve pressure cooked the beans place the pressure cooker under cold water to cool down the pot and to allow for easy release of the lid without scalding hot steam. 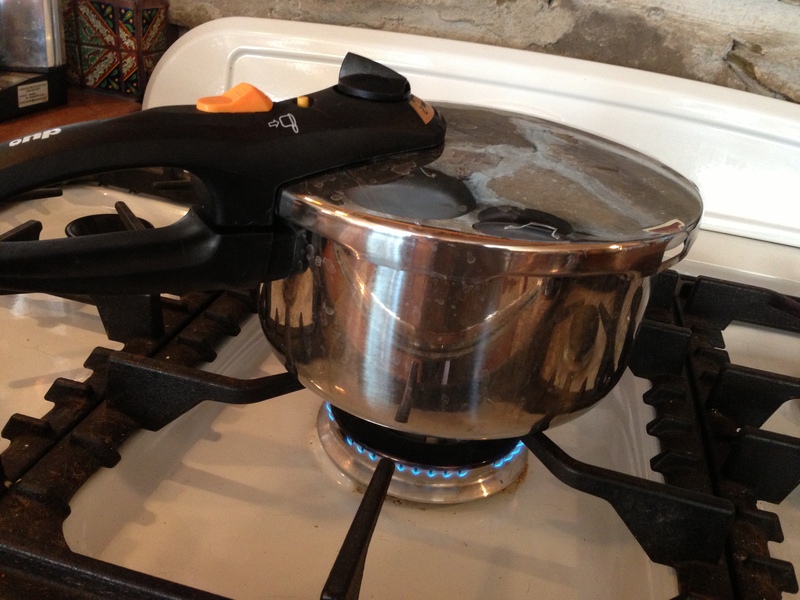 After you’ve cooled down your pressure cooker you can safely open the lid and place your beans in an ovenproof pot. Soak and rinse the beans as described above. Place rinsed beans in a large ovenproof pot and cover with 8 cups of fresh water. Bring to a boil. 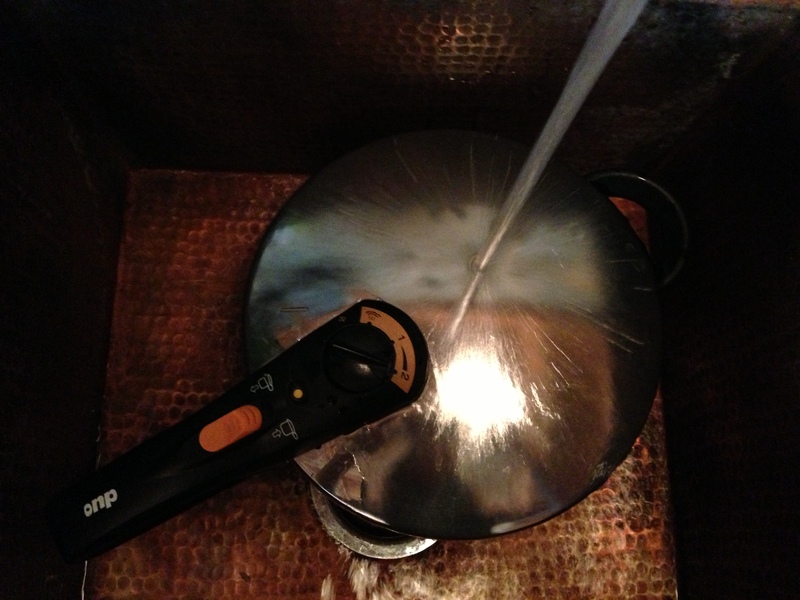 Reduce heat and simmer covered for 1 to 1 -1/2 hours – until tender. Stirring occasionally as they simmer. Drain the beans reserving at least two cups of the liquid. Return the drained beans to the ovenproof pot. Combine all of the ingredients in a large ovenproof pot. 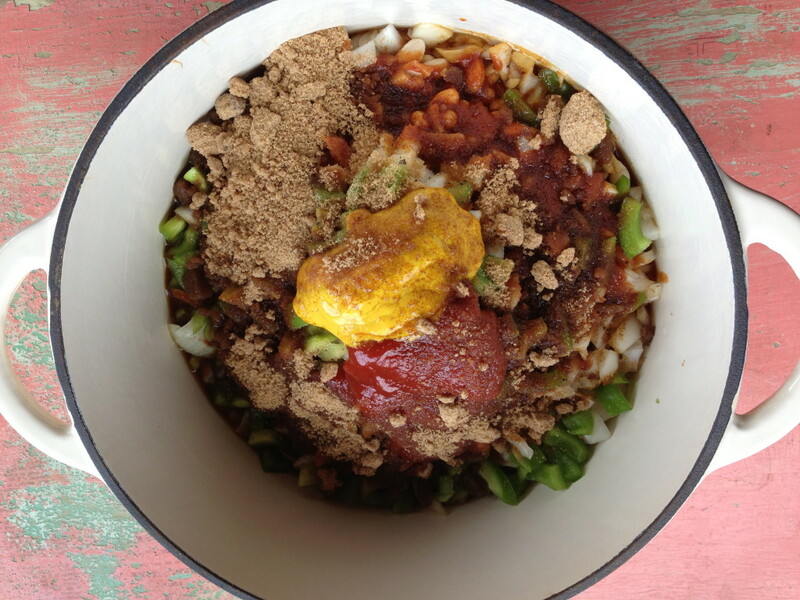 Cover with a lid and bake low and slow at 275° for 2 -1/2 hours. Remove pot from oven, stir the beans, and determine if your beans are done. They will probably be tender and ready if you live at a lower elevation. Here at the Dusty Dog my beans are still cooking. I added another 1/2 cup of bean liquid at the 2-1/2 hour point. It’s been 3- 1/2 hours now, and my beans are still a little tough. Looks like baking these beans might be an all day affair, but no matter how long they take, I know they will be a sugary delicious, melt in your mouth treat when they are done. 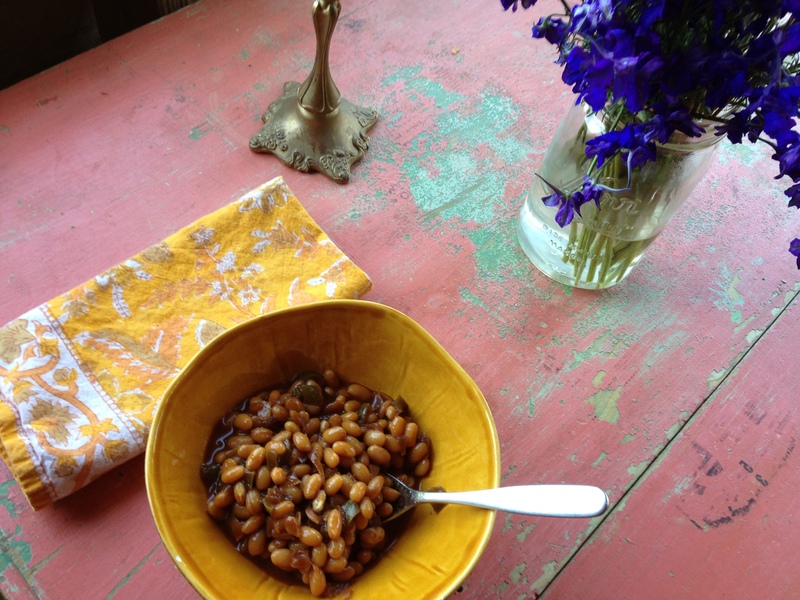 Please Note: If you used canned, drained beans you will bake them until they have thickened – about 2 hours. 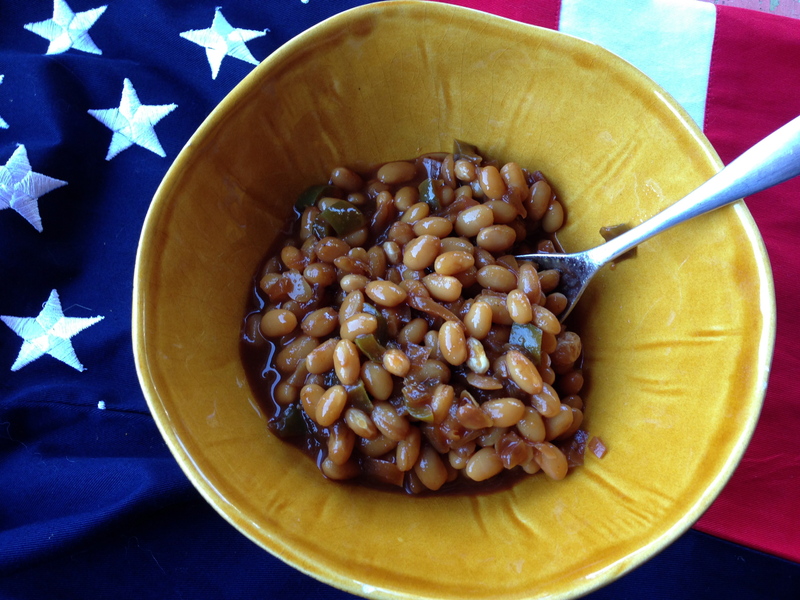 This entry was posted in Beans, Celebrating, Recipes, Sides, The Dusty Dog and tagged Baked Beans, Beans, Entertaining, Fourth of July, High Altitude Cooking, Independence Day, July Fourth, picnic, Sides, Vegetarian. Bookmark the permalink. We wish we were with you tonight to share your yummiest beans for your 4th of July party. We wish you were here too Faye! Thanks for including the ‘high elevation’ instructions!